For someone who is relatively new to guitars, the acoustic guitar is an excellent choice as a first instrument. One of the biggest advantages of an acoustic guitar is that it will always be ready to play regardless of where you take it. Another distinct advantage of the acoustic guitar lies in its ability to produce sound without needing amplifiers and fancy electronics. Learning to play the guitar requires patience and dedication, but the single greatest challenge is that of buying the right instrument. The guitar you start out with is often a real-game changer and could either enhance or destroy your whole experience. With so many different brands of acoustic guitar on the market today, finding the right acoustic instrument can be a daunting and overwhelming task. This piece seeks to arm you with the right information by highlighting the top acoustic guitar picks for starters. The guitars that feature on our reviews have been thoroughly tested by professional guitarists and technicians taking into account sound quality, playability and purchase price. All the guitars mentioned on this list are available for purchase at amazon.com. The Canadian seagull S6 is often touted as one of the best budget acoustic guitar for beginners and with good reason. For one, the guitar is made from materials that are most common in high-end guitars. This acoustic guitar is crafted from quality Canadian wood. It boasts a solid cedar top which is complemented by wild cherry on its back and sides. Its distinct tapered headstock allows for greater tuning stability. The build materials and outstanding craftsmanship on this guitar vastly improve the longevity of the instrument making it a good buy despite its price. • Its rosewood fretboard is slightly thicker than what you’d find in other standard acoustics making it ideal for strutting. Though Taylor is mostly renowned for its high-end guitars, they also produce some premium entry-level guitars. The Taylor Academy 12e is unique in that it combines the best of both acoustic and electric guitars. The guitar is part of Taylor’s iconic Academy series which is designed to beginner’s the best possible playing experience at an affordable price. This acoustic-electric guitar boasts a grand concert body finished in solid Sitka spruce on the top, layered Sapele on its back and sides, mahogany armrest with the genuine ebony fingerboard. The electric components, though not a necessity are a bonus that most people will appreciate. Yamaha has been in the guitar producing business for over five decades now, and they indeed produce some of the best-selling acoustic guitars on the market like the Yamaha FG730. The Yamaha FG830 not only looks great but sounds just as good and is conveniently priced. This acoustic guitar sports a natural solid spruce finish on its top, rosewood on the back and sides, as well as a fingerboard finished from rosewood. The FG830 produces warm, rich tones with great bass. The guitar is comfortable on hand and easy to play making it an ideal choice for beginners. The CD-60S is one of the most popular Fender guitars on the market today. It is an ideal choice for people seeking a high-quality dreadnought guitar with great tones and easy playability. The CD-60S acoustic guitar features a solid spruce top with mahogany on its back and sides. Its mahogany neck and smooth rosewood fingerboards with rolled edges further contribute to its easy-to-play profile. The fender CD-60S thanks to its stunning looks, comfort, playability and good value for money makes it an excellent choice for both beginners and intermediate guitarists. The AD30 is an entry-level acoustic guitar from the famed Alvarez brand. The AD30 makes our list of the top acoustic guitars for beginners because it competes quite well with the other guitars on the list despite its affordable price. In fact, the Alvarez built this guitar specifically for beginners. Despite its low price tag, it still manages a solid Sitka spruce top as well as mahogany on the sides and back. The neck houses a rosewood fingerboard with 20 frets. Overall, this acoustic guitar sports a natural gloss finish. Buying an acoustic guitar can prove to be a tricky affair. There are a variety of options available for you. To get the best guitar, one must base their choice on a variety of factors. Acoustic guitars vary in price and before embarking on a search, one needs to ascertain how deep they wish to dig into their pockets. A good new guitar will typically range from $300. One can, however, get a cheaper and better guitar by settling for a second-hand guitar. The finishes of a guitar also influence the price. Acoustic guitars with a laminate top tend to be cheaper than those made of solid wood. As a beginner, you will need to upgrade your guitar eventually and therefore go for one that gives good quality sound and has a reasonable price. In the market today, there are a variety of guitar brands for one to choose from. As a beginner, the internet is a rich source of information on the various acoustic guitars and their features. Most popular guitar brands such as Yamaha, Fender, and Taylor make high-quality guitars at a variety of price ranges. As a beginner, they are your best source of a good acoustic guitar. An electric acoustic guitar has various electrical components that amplify sound and also enhance the sound effects. The electrical version is, however, more costly as compared to the basic acoustic guitar. As a beginner, a basic acoustic guitar would work just fine, and the purchase will also be friendly to your pocket too. Later on, one can always upgrade to a more powerful electric version of the acoustic guitar. Acoustic guitars will come in three basic shapes; classic, jumbo, and dreadnaught. Based on your preference and advice from a specialist, go for a guitar with a shape that you are comfortable with. As an upcoming guitarist, it will make playing the guitar more enjoyable. As a beginner, it is wise to have someone who has is familiar with the various aspects of guitars to accompany you when making a purchase. Test the guitar and analyze the various aspects of the guitar such as the body and intonation. 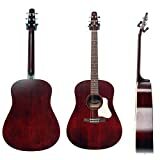 This is one of the few electro-acoustics guitars that is recommended for beginners and goes for 649$ on guitar centre and Amazon. One can purchase the guitar from 404$ on Amazon and 399.99 $ on the guitar centre website. The guitar is priced at $299.99 on Amazon. This fantastic guitar goes for $249.99 on Amazon. 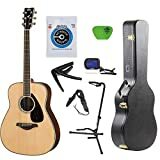 One can get either a used or a new guitar from 199.99$ on Amazon. The new model of this guitar goes for $349.99. The guitar goes for $199 on Amazon and comes with free shipping. The guitar is priced at $249.95 exclusive of shipping charges. One can get this guitar from $63.99 on Amazon. Playing the guitar requires both skill and mental preparedness. As a beginner, it is always important to start on the right footing so that you do not only get skill but perfect the art of playing the acoustic guitar. Playing the guitar is not something you can learn in one day. It requires practice and patience. Make an effort of playing for at least 10 minutes a day. Start with the easy stuff such as learning the chords and build your confidence.  Be ready for frustrations. It may take time before you get the tones or even learn how to hold the guitar properly. These challenging moments are very crucial, and one should always be optimistic. Do not shy away from trying out hard stuff as practice makes perfect. When playing the guitar, it is important to have an upright posture that enables you to reach all parts of the guitar such as the machine head and fretboard with ease. If you plan on sitting down on a chair, avoid chairs with arms. They can restrict your hand movement and interfere with how you play the guitar. As a beginner, you need someone to guide you as you master the art of playing the acoustic guitar. Jamplay is one of the leading online guitar websites offering online guitar for beginners and seasoned acoustic guitar musicians. As a beginner, to start your lessons, you need to sign up first. Various payments plans allow for monthly, yearly standard and yearly pro subscriptions. Upon signing up you immediately gain access to free jam tracks and a gate pass to the various online classes available. Being an online platform, Jamplay gives you the opportunity of learning how to play the guitar from the comfort of your home. The website is equipped with over 400 courses that you can access at any time of day, and they are categorized into levels. The material on the site is well researched and approved by the master acoustic guitar players such as Brent Mason, Kaki King, and Bumblefoot. By enrolling for Jamplay online classes, you will be learning from the best. At Jamplay, each student is treated differently and assigned a specific tutor if need be. To aid in learning the website is updated continuously with weekly live online courses that aid in learning. The developers of Jamplay have invested heavily in technology to make learning more exciting and interactive. One can download their guitar teaching app and enjoy the online guitar classes during their free time from their mobile phones. At Jamplay, online tutors pay keen interest on a students performance. You are frequently given progress reports and teaching reviews. The feedback helps a student develop their skills. With such a comprehensive training program, as a beginner, Jamplay online guitar training classes are what you need. Enroll for the online acoustic guitar training classes today and start the journey of becoming an excellent guitarist.